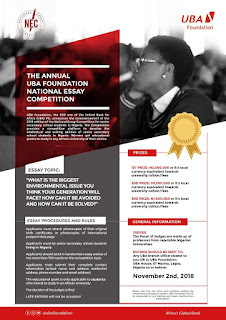 UBA Foundation arm of United Bank for Africa (UBA) Plc, Annual National Essay Competition Form, Eligibility, Topic, Prizes and Application Guidelines for Senior Secondary Schools in Nigeria for 2018 [8th Edition]. 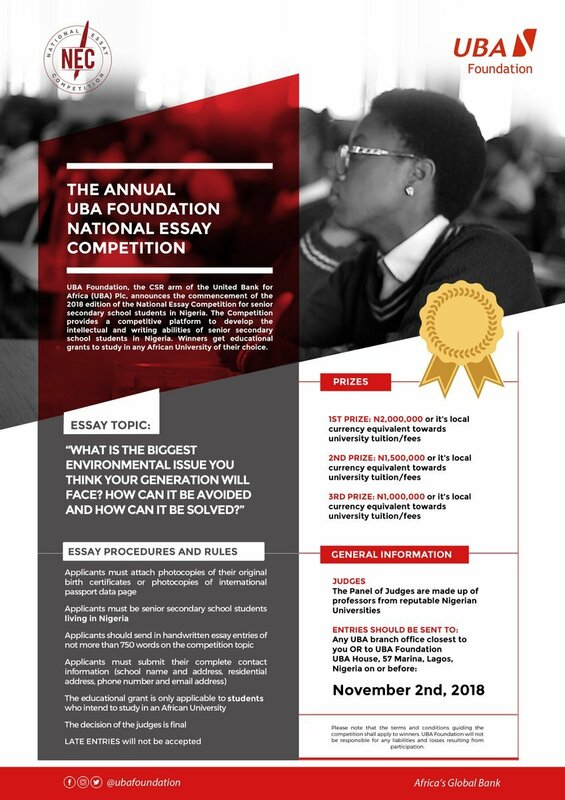 UBA Foundation, the corporate social responsibility arm of the United Bank for Africa (UBA) Plc, announces the commencement of the 2018 edition of the National Essay Competition for senior secondary school students in Nigeria. The Competition provides a competitive platform to develop tho intellectual and writing abilities of senior secondary school students in Nigeria. Winners get educational grants to study in any African University of their choice. The competition which is a follow up on the Foundation’s Read Africa Initiative, provides a competitive platform to develop the intellectual and writing abilities of senior secondary school students in Nigeria. Winners get educational grants to study in any African University of their choice. The competition has been held annually since 2011 with students challenged to write on different engaging topics to test their writing and cognitive skills.